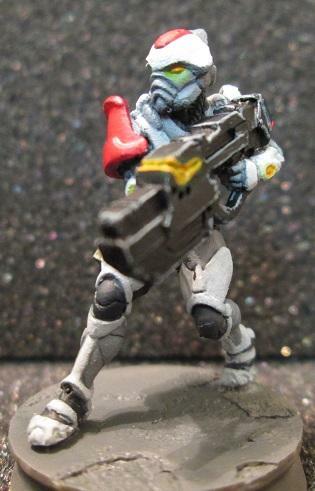 I figure I might as well start posting my Infinity figures here since they aren't getting much attention elsewhere. Plus, I can use this thread as something of a Plog while I work on my figures. I'll point out, I'm mostly getting these figures because I like them more than out of interest in playing the game. I am interested in playing it, mind you, but nobody around here plays it and nobody I know that does play miniature games is interested in playing Infinity. So, if these figures see any game usage, it'll be in other games, like Flying Lead or Fear and Faith. So, I might as well post my first figure that's fully completed. I really like this figure. Great sculpt and he's just plain cool looking. He actually has me somewhat interseted in building a small Ariadna force. I've got a blister of the out of production Line Kazaks waiting to be worked on. I've shown this one before, colors based on Medusa's CA color scheme. He's totally done, but I should probably clean up his base sometime and put something onto it. 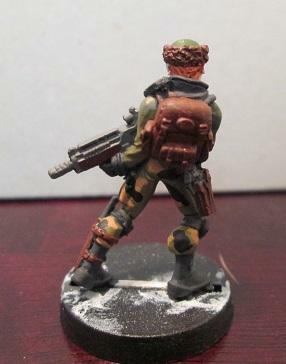 Kaplan Tactical Services is done, but this picture was taken before I dipped him. I'll be dull coating him tonight as well as cleanup on the white bits. I just ordered the rest of the Kaplan crew last night. Like the Vet. Kazaks, I really like the designs. I can't wait to have them all together. Not the best pictures I could have taken, but they get the point across, plus you can zoom in in the gallery. I was trying to match the colors used in the art and what was suggested to me as being used in the studio colors, but I don't think they're all that good of a match. Next time I do knights, I'm using all greys. This is also my first attempt at using glazes. Despite not being too happy with how dark the blue looks, I think he came out all right. He'll be getting dipped tonight. 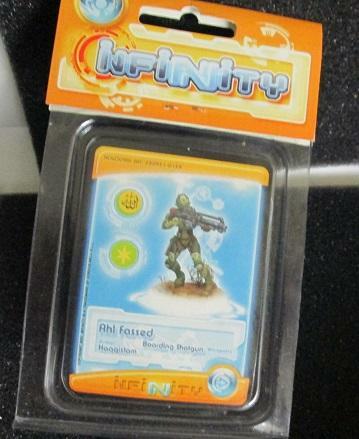 Nice to see someoone else with the old Infinity ADD, one faction is never enough! 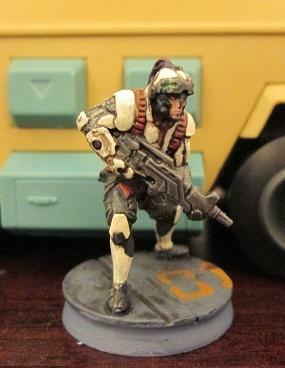 I like the markings on the vet kazak, i should probably try ading some to mine at some point. 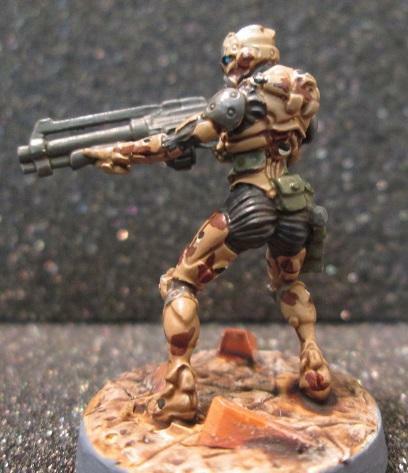 Have you had a look at Angel Giraldez's blog?It has colour recipes for most of the factions so you should be able to match the colours he uses pretty closely. Although matching the paint job is another mattter! Look very nice! Think I probably like the Kazak most, just for the colour combination and you've got the realistic look for him nailed. Like the bright, clean paintjob on the Knight too however. Will be interested to see where you go from here! Thanks for the replies. The Vet Kazak is easily one of my favorite figures. The other would probably be my Chandra Spec Ops. So, I have two more figures to show, both fully completed: My Chandra Spec Ops and a Thorakitai. Her colors are obviously not Aleph. 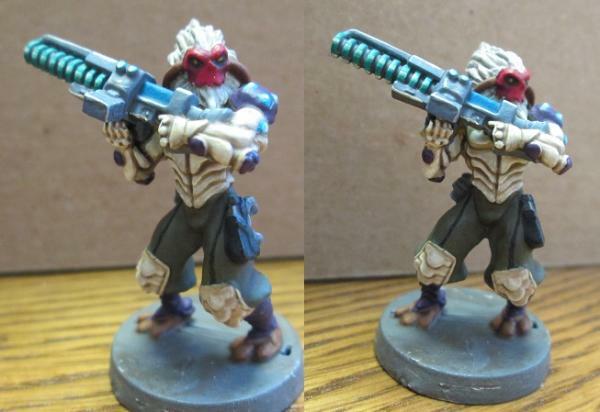 There was a picture I'd seen on Google showing this same figure in Nomads colors with (I think) a Prowler's head and a Nomad rifle. It looked really cool and the colors worked way better on this mold than the actual Aleph ones, so I decided to copy it. I really like how she turned out. 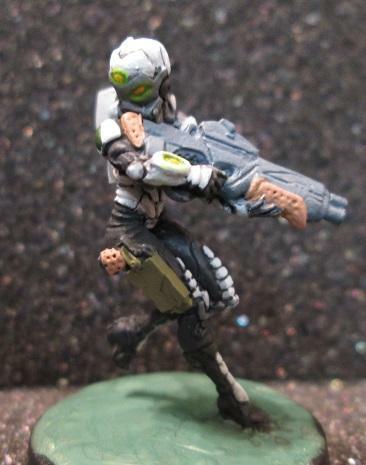 She's actually the first Infinity figure I painted. On top of that, I'm really pleased with how her face turned out. One of the best I've managed to paint. There was a seller on Ebay selling the figures from the set individually, so I thought I'd get one and see if I could copy the studio colors. I'd ordered the one with the chain rifle, but the seller accidentally sent this one instead. I didn't really mind all that much though. I'm not pleased with this figure. The pictures actually managed to make him look way better than he actually does. I think if I'd tried to do my own thing or just continued using the Nomad colors, my opinion of this figure would've been a lot higher. I had a lot of issues with getting his arms painted. The paint kept gunking up the details. In the end I suppose he's fine, but I know I could've done better. If I ever buy the whole set, I'm going for a different color scheme. Definitely like your approach to that Spec Ops, she looks very nice! I wonder if a alternate color scheme could save aleph for me, cause I just don't like them visually. Nice work. Nice paint jobs. On your Thorakitai, what kind of white did you use? @Grimdork- I totally get where you're coming from. They have a somewhat unpleasing look to their general design. Only a few really stand out as looking "cool." The Steel Phalanx, Ekdromoi, the Chandra, and the Dakini are really the only ones out of Aleph that I actually like. The rest are just kind of ugly. I do think that some alternate colors would do them some good though. Once she's been released, I intend to pick up Nesaie. I think she's actually one of the cooler female characters in the line and also manages to be one of the few that isn't cheesecak-ish in any way. @Mashguy- If I'm remembering correctly, I believe I'd used Vallejo Bone with highlights in ivory. It wasn't the best combination to use. Yeah, she's not bad. I'm not in love with the model, but I do like that there is minimal cheesecake. That's a big part of why I like her figure. I started work on my Line Kazaks. The ones I picked up actually turned out to be the out of production set of them. I'll probably get the current ones somewhere down the line just so I can have some more variety. If/when I get the current ones, I may also do some mods to their weapons so I can get some extra use out of them. I kind of rushed on this guy as I just wanted a really basic color scheme on him. I decided to give him so camo pants just so they'd be differentiated from his shirt sleeves. He'll probably be the only one sporting camouflaged pants though. I'd hate to have to paint it on a bunch of figures. I have to say, this dude has a really ugly face. I also noticed something else about him. That's not perspective, he's actually a fair bit bigger than my Veteran Kazak. He's also a bit bigger than most of my other true scale figures. Plus he has a huge head. Anyway, I'll greenstuff him up a base like I did for my Vet later. I'm thinking for the other two, what I'll probably do for their colors is use the dark green I used for my Vet's armor on their pants, the lighter green for their shirts, and stick with the dark grey for their boots and body armor. Well in order of my favourites; chandra, the vet kazak then probably the morat. For chandra, its mostly due to the face. If it was covered I'd probably like the kazak the most, but they're not easy, and that one is impressive. I am in agreement with the thorakitai, I've always found it difficult to do cream or white colours without them appearing thick whilst still being a full colour. Another point I think that's worth mention is the yellow light effects on the pano knight. 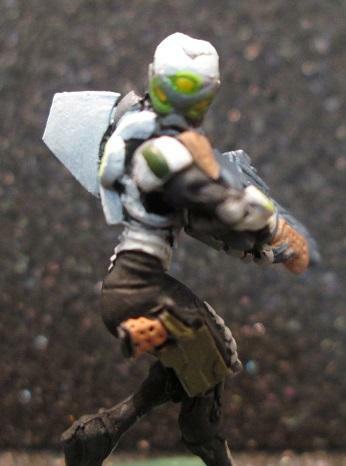 I particularly like the one on the left shoulder pad, its come out nice with a clean dark border for contrast. Overall; ACE! I wasn't trying anything fancy with the lights on the Pano knight. Just experimenting with the Vallejo Glaze Medium and some yellow paint. I just blobbed some yellow glaze in a vaguely circular shape and stuck some white in the middle. That was it. Very easy to do. Glad it came out looking alright though. I'll be doing it like that for sure next time I paint the lights. So, I've got left, Miranda Ashcroft, or whatever her name is, a Domaru Butai (those are the smurai, right? 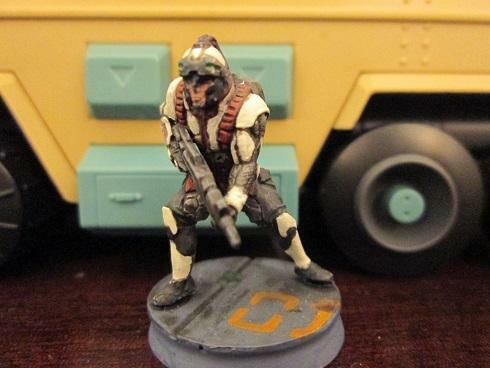 ), and 2 more Line Kazaks. 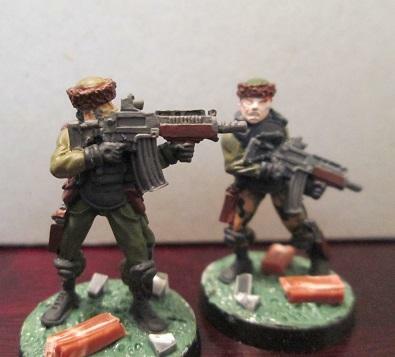 I've ordered an Ahl Fassed and the rest of the Kaplan Tactical Services figures. I'm trying to decide which batch of line infantry to get next. Zhanshis, the new Line Kazaks, or the Ghulam Infantry? 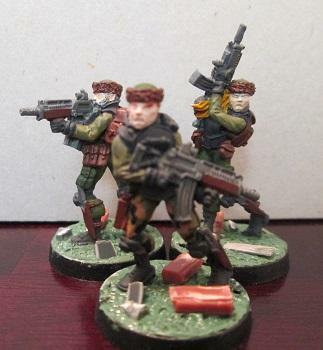 Or should I just grab a few Imperial Services figures like the Tiger Troops and the Celestial Guards? 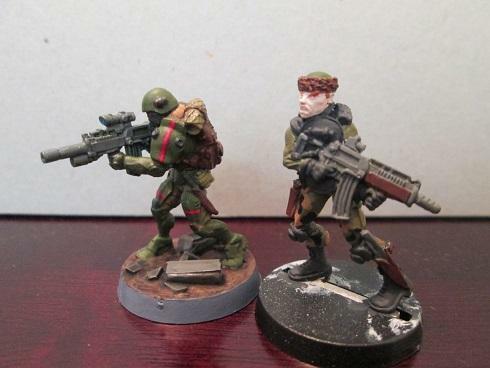 You're comparing two models from two 'eras' of Infinity design. With first edition, the models were much more exaggerated, almost as much as 40k. 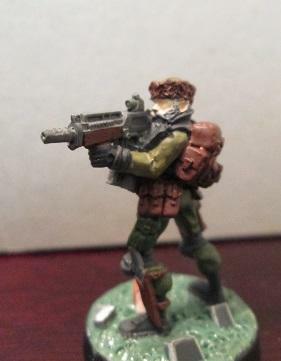 Big hands, big heads, bigger overall model, badly proportioned, very big guns. With 2nd edition, they tried a new tack that stuck - properly scaled models. That's why newer models tend to be smaller, with better proportioned hands and heads and weapons tend to look quite small. Look at any of the old Line Infantry, and you'll see the same things - Alguaciles, old Ghulam, Fusiliers, Zanshis, etc. I'll admit, I rushed a bit on the other two Line Kazaks. But, they're done and all three have their bases done, too. So, I can go ahead and get them dipped now. I'm calling this guy Beardo. You know, because he has a beard. The paint got kind of thick on her face. That or the details on her right side were fairly soft. Or both. Either way, I lost a little detail there, unfortunately. Finally, Melon Head, Beardo, and Blondie pose together. Now, which starter box do I want to get? 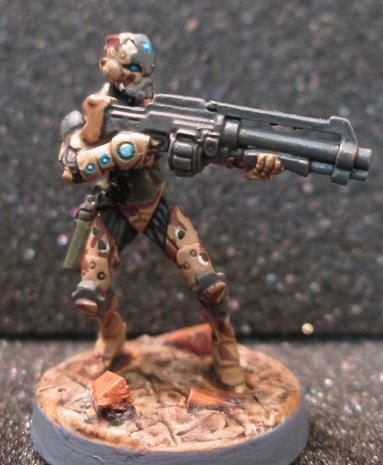 Ariadna, Yu-Jing, or Imperial Serivces? Okay, I got my Kazaks dipped along with some other figures tonight. I'll be able to get them all finished up tomorrow evening. I also got my Ahl Fassed today as well. She'll be fun to paint. I'm thinking I'll go with a desert-ish color scheme. Sweet! But remember this is the internet.. Pics or it didn't happen! Awesome job there! I'm particularly impressed with the Knight but that CA guy looks great too. They all look great. Well, you can thank Medusa for the CA color scheme. I was just copying someone else's colors. Okay, pics or it didn't happen, eh? Well, here's my next project. It's raining today and probably will again tomorrow as well, so I don't expect to get much work done on her. I plan on spray painting her, so the rain makes that kind of difficult. Yeah, Melon Head's eyes are kind of wonky. I don't care. I'm not going back to fix them. That'll just make things worse. It's kind of sad that this is it, but here's my current Ariadna force. I'm guessing I'll probably be suffering from burnout before I finish all of them. I still also have the Ahl Fassed, male Domaru Butai, and Miranda to do. That's a lot of figures. Okay, I have an update! I was productive tonight. It didn't rain, so I could use my spray paint. Unfortunately, it's nearly run out now, but at least there was enough to basecoat my Ahl Fassed. I tried doing a chocolate chip desert camo on her armor. The result is alright. It could've been better, but I tried to keep it scaled to the figure which made it a bit more difficult. The chest probably turned out looking the worst as a result, but thankfully the shotgun covers it all up. I'll be dipping her as I have with all of the others, so hopefully that'll smooth everything out and clean up some of my mistakes. If it doesn't, I suppose a brown wash can do just as much good. I have to say, she's one of the harder Infinity figures I've done. She's so damn small, I couldn't pin the arms even. I also started on my Domaru Butai, but I think he's actually turning out to be a bigger pain because of those swords of his. If I work on any figures over the weekend, it'll be him. Looks very cool, think the camo looks effective and suits Haqqislam very well. Will be interesting to see what it looks like post-wash. The Domaru is one of my favourite miniatures, will be interesting to see what you make of it. But yes, the swords are a pain in the backside, think I ended up putting mine across the body rather than going on the official version from the website pic. The Domaru look cool, yeah. But those swords! Those are going to piss me off to no end. I think I'm going to follow your lead and not put them on the hips. If I put them there, they're just going to get bent out of shape when I transport them. The figure's back will be a much better spot for them. I'm not planning on doing anything too crazy or interesting with the Domaru. I'm going to do like I did with the Kaplan and pretty much stick to the stdio colors with some minor variation here and there. However, the rest of my Yu-Jing stuff, when I get it will probably follow the same color scheme as the JSA. 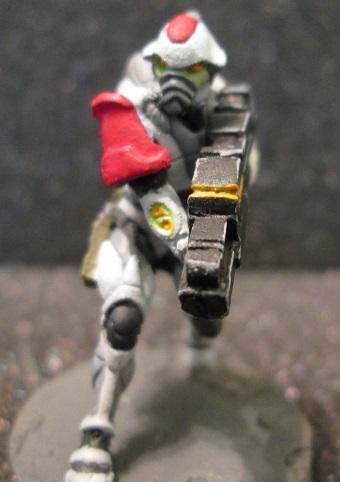 I figure if Yu-Jing is pretty much supposed to be the evil empire, I might as well paint them up as the Empire. 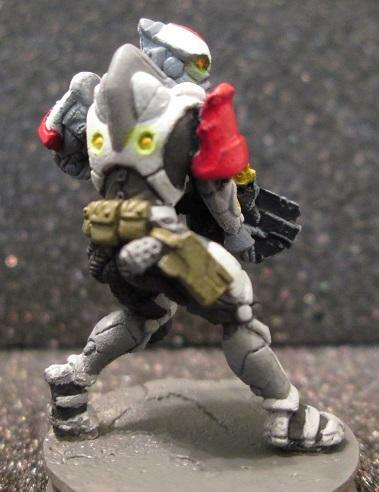 So, primarily I'll be painting things in my usual dark greyish blackish color with armor plating in white. It'll be a pain, but if I can pull it off, it should look decent. I'll differentiate between JSA and Imperial Services through shoulderpad colors. Red for JSA, orange for Imperial Services. I'm not planning on doing anything too crazy or interesting with the Domaru. I'm going to do like I did with the Kaplan and pretty much stick to the stdio colors with some minor variation here and there. However, the rest of my Yu-Jing stuff, when I get it will probably follow the same color scheme as the JSA. 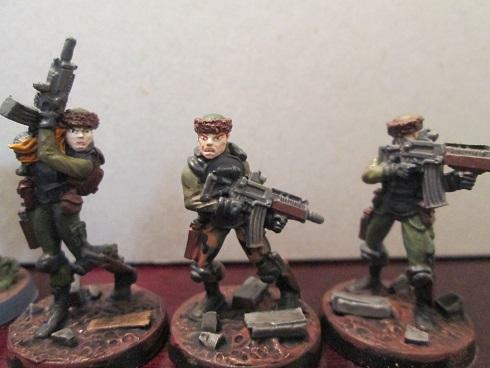 I figure if Yu-Jing is pretty much supposed to be the evil empire, I might as well paint them up as the Empire. 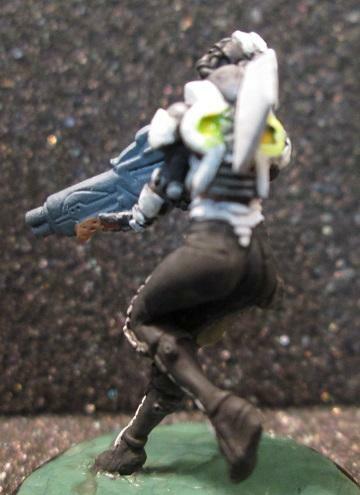 So, primarily I'll be painting things in my usual dark greyish blackish color with armor plating in white. Evil Empire? That's my colour scheme for (unofficial) Korean Sectorial. Might never do it, it doesn't hurt to have few sketches on the board. 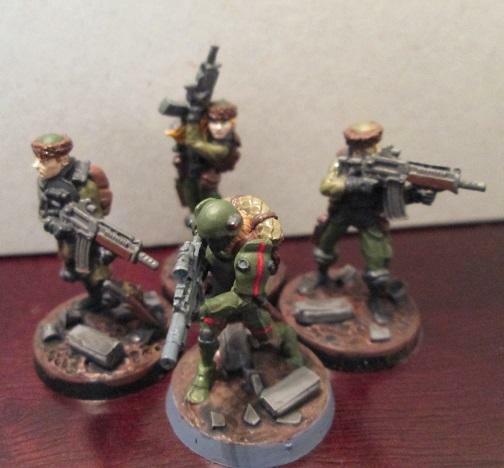 Nice minis you have there, though the Kazaks look a little too pale. Eh. They're fine for my tastes. I got my Kaplan box today and finished priming my Domaru Butai. I also sculpted a base for the Ahl Fassed, but I'm not happy with how it looks. Hopefully it'll end up looking better once it gets painted. I'm going to have to hold off on the Kaplans though since I'm actually out of scenic bases. So, I'll have to wait until the batch I ordered earlier in the week arrives. Well, this has been a weekend for getting Infinity stuff. Today I got my Tiger Troop, my Celestial Guard hacker, and my Yu-Jing starter. On top of that, the seller I got the Tiger from threw in a free bilboard sign from Underground Lasers. I went ahead and put that together. It seems pretty nice. I'll have to get it painted up sometime soon. Maybe I'll even get some of their scatter terrain. The meat vender stall seems pretty cool. I'll definitely need to get more scenic bases too. I don't care for having to sculpt my own. Edit- Okay, I decided to go ahead and order the meat vender stalls and a refrigerated container from Underground Lasers. 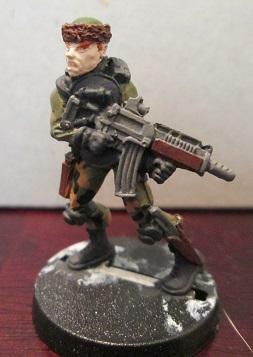 It turns out, the ebay seller I got the Tiger Soldier from was in fact the guy that runs Underground Lasers. That was cool that he threw in the freebie. It certainly worked in getting me to make an order. Here we go, the Ahl Fassed is all finished and the Domaru Butai's paintjob is done. He just needs his swords and a good dunking in the dip. I fiddled around with my camera's settings and managed to get some pretty good looking closeups. I think adjusting the background helped a little with that. I wasn't too hot on how she was looking prior to dipping. Now, I really like how she turned out. The base not so much, but it'll have to do. Here's the Domaru Butai. These colors will probably apply more to the HI rather than the LI. 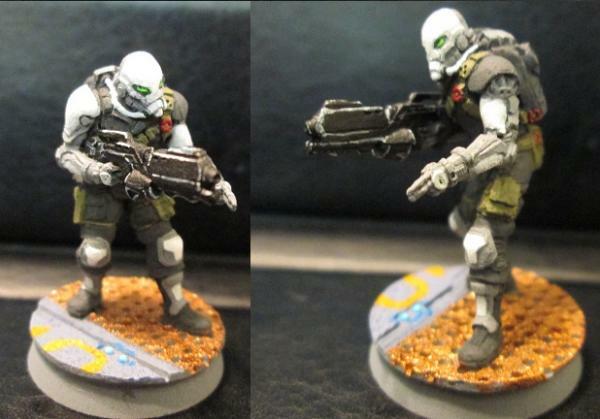 The infantry will probably have more of the dark grey on them. I'm not sure about the lights on the gun. I may get rid of that. I like how the eyes and the lights on the armor turned out though. 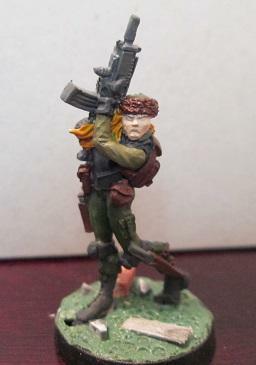 Okay, my Tiger Soldier is more or less done. I still need to dip and base, but beyond that, she's finished. 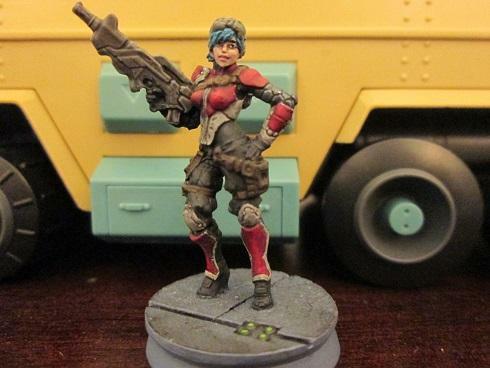 She will also be more representative of how I'm going to be painting my Yu Jing figures. As I said before, I'll be marking the shoulder pads with orange for Imperial Services, red for JSA, and I've decided I'll do green for regular military. Her backpack looks kind of like a classic Cylon face. I know that's not supposed to be a third eye or a sensor, but I think it looks cooler that way. Does anyone know how a Tiger Soldier is supposed to perform an aerial insertion? Is that supposed to be an integrated jetpack on her armor or something? What's the fin for? A heads up as well, I still don't have my bases yet, so until I get those, I won't be doing any more Infinity figures, plus I'm going to be house sitting for the next week and I won't have access to my paint anyway. I'll try and finish up the Tiger Soldier and the Domaru, but that's all I'll be able to do. I'll try and post pictures when they're finished, but there won't be any new figures up for a little while.